Goalkeeper Ross Connelly used to go school in Falkirk - now he’s set for a lesson in how to handle the elite level of European football. The 17-year-old graduate of the Graeme High Scottish FA Performance School is now with Hamilton Academicals and played a key role for them as they lifted last season’s Scottish FA Club Academy elite youth league. 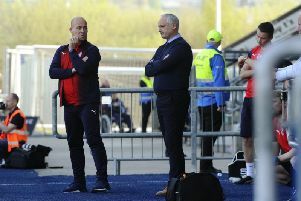 That earned the Accies youngsters a crack at the UEFA Youth League - effectively an under-19 Champions League - and next month they will take on Swiss champions FC Basel in a two-legged first round tie. The competition is split into two pathways. One mirrors the group stage of the senior competition with the youth teams of the 32 clubs playing each other at the same time as their senior counterparts. The other, the section Hamilton are in, has national youth champions playing each other in a series of knockout ties. The two pathways eventually converge later in the season - and Ross admitted that seeing Hamilton’s name in a competition with the likes of Barcelona, Juventus and Bayern Munich has an almost surreal feel. He joked: “It just doesn’t fit, does it? “But I think it’s more refreshing because it’s not Rangers or Celtic, that just adds to how special it is. “The draw was seeded so we had a fair idea of the teams we could have been up against. We could have got Montpellier or Dynamo Kiev. “It’s exciting because it’s a trip away and it’s obviously going to be a great team we’re playing against, so that’s a good challenge for everyone. “Last season Basel’s under-19 team were in the group stage and they topped their group, beating teams like Manchester United, Benfica and CSKA Moscow. Accies’ achievement lastseason - they clinched the title with a 3-1 win over Celtic - was made all the more remarkable by going through the season unbeaten. With 14 clean sheets from 24 games Ross played a major part and is enjoying his time at a club with a reputation for giving youngsters a chance, as shown by the likes of James McCarthy, James McArthur and Greg Docherty. The Cumbernauld teenager, who has played twice for Scotland at under-14s and three times for Scotland Schoolboys, belives Accies will give him a good grounding for his future career. He said: “I’ve been with Hamilton for six or seven years. It’s a good environment to be in, there’s a lot of opportunities for young boys pushing through, a lot of first team opportunities. In total 13 Graeme pupils have earned full time professional contracts in both Scotland and England, seven from Ross’s year alone, and he is also among 13 who have have represented Scotland at national youth team level.